Craney Island was once separate from the western edge of the Elizabeth River. It was home to enough herons to justify its name. Today, it is a dredge spoil site. Silt/clay/sand is excavated from the bottom of the Elizabeth River and Hampton Roads to maintain the depth of the shipping channels ("dredge spoils"), then barged or pumped to the site. 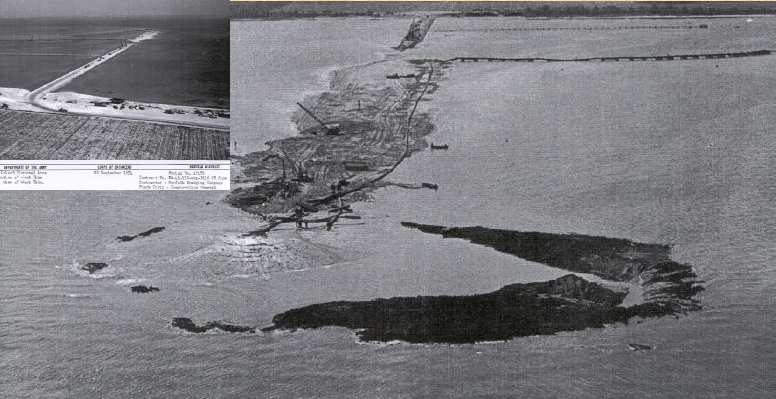 Since World War II, the original appearance of Craney Island has changed dramatically. 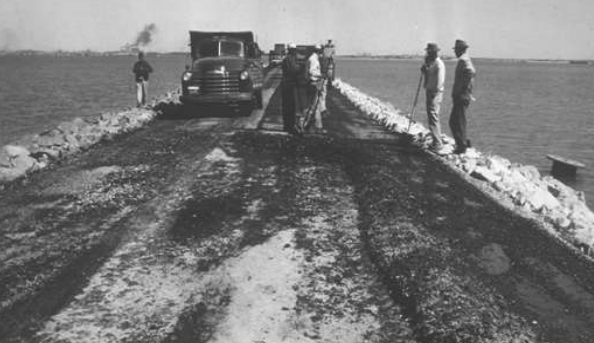 In 1938, the Thoroughfare (a channel separating Craney Island from the mainland) was filled in and Craney Island became a part of the mainland. 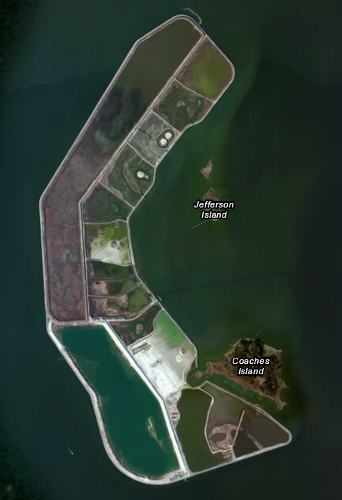 Starting in the 1950's, the US Army Corps of Engineers surrounded the site of the original island with dikes, creating what is now the Craney Island Dredged Material Management Area (CIDMMA). 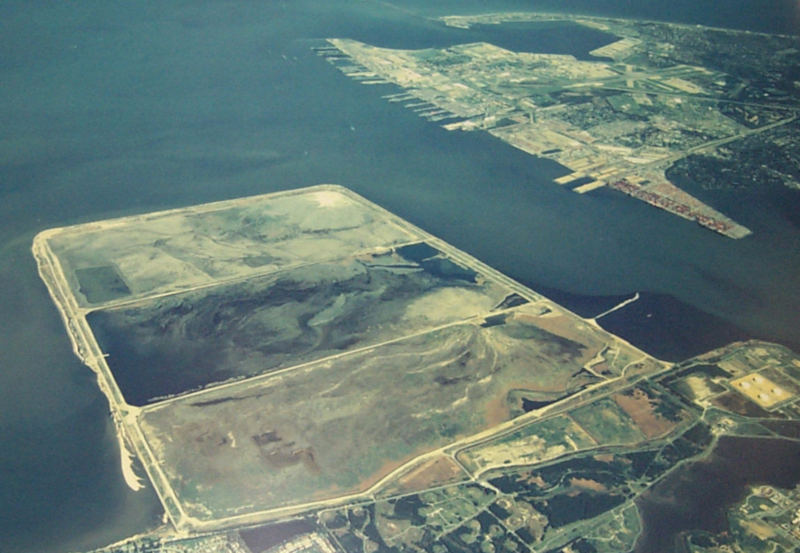 When first completed in 1957, the 2,500-acre Craney Island disposal site was expected to receive 96 million cubic yards of sediments dredged from the Elizabeth River and Hampton Roads shipping channels and be filled by 1979. 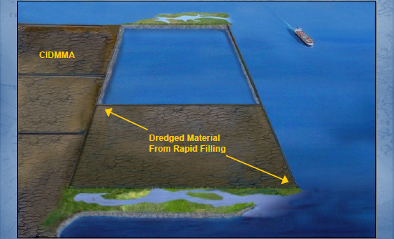 By 2004, the facility had received 225 million cubic yards of dredged material, thanks to various techniques to increase capacity, and still had decades of useful life remaining. The last planned expansion, adding 580 acres on the eastern edge, is now underway. 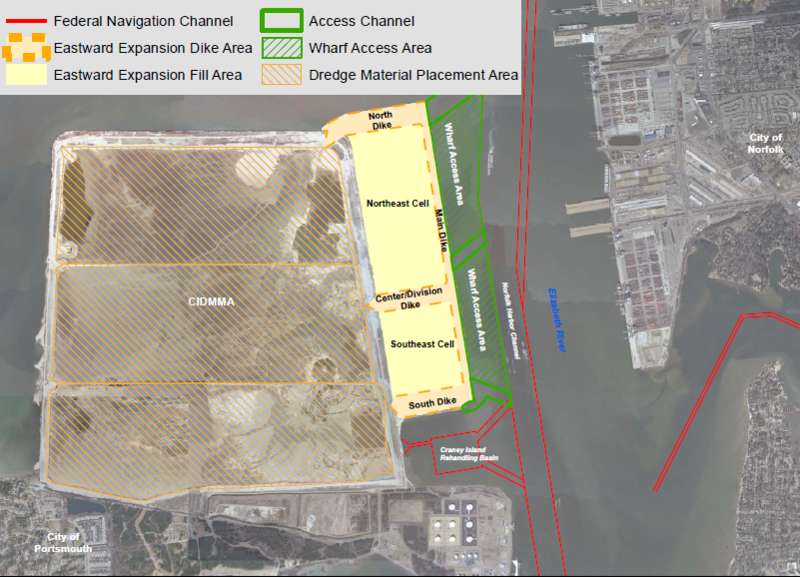 The Virginia Port Authority plans to construct the new Craney Island Marine Terminal (CIMT) on the top of the expansion, providing a 20% increase to the ports capacity (handling 19 more vessel calls per week). 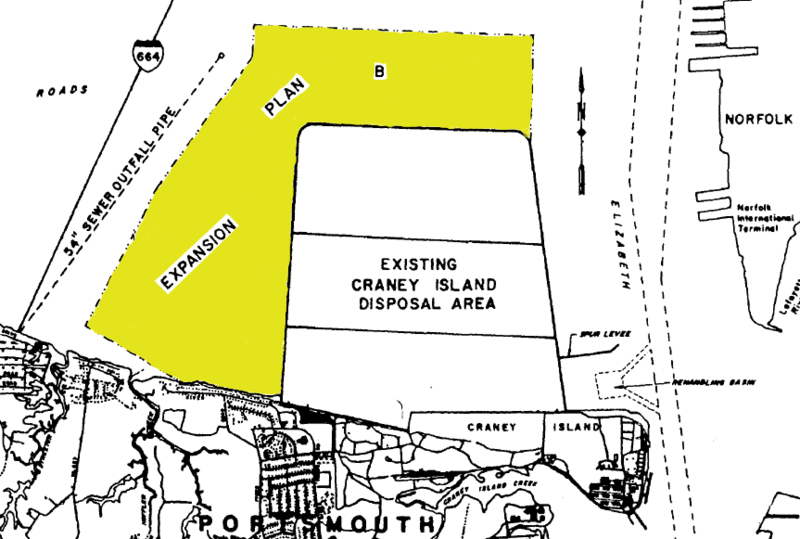 Initially, submerged land next to Craney Island was used as a spoils dump site; no containment dikes were constructed. Between 1917-1927, the US Congress authorized dredging a 40' deep channel to the ports on the Elizabeth River. 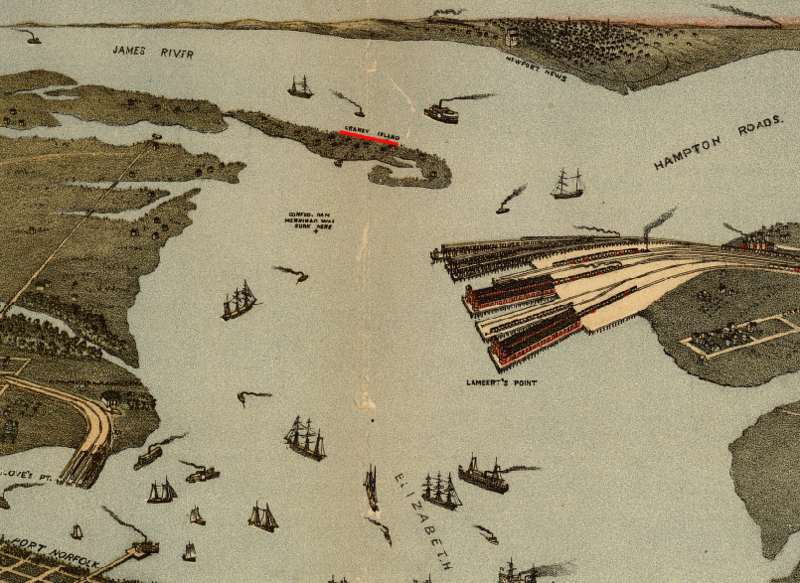 Large amounts of material dredged to maintain river channel depth were deposited near Craney Island between 1920-39. That initial disposal was uncontained, and sediments could wash back into the Elizabeth River channel over time. The River and Harbor Act of 1946 authorized construction of a contained dredge disposal site at Craney Island. 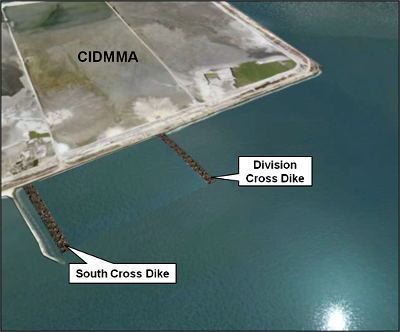 Between 1954-57, the US Army Corps of Engineers constructed confining dikes to enclose 2,500 acres at the Craney Island Disposal Area, now known as the Craney Island Dredged Material Management Area (CIDMMA). The site was authorized to receive material excavated in association with navigation projects, primarily deepening and maintaining shipping channels. 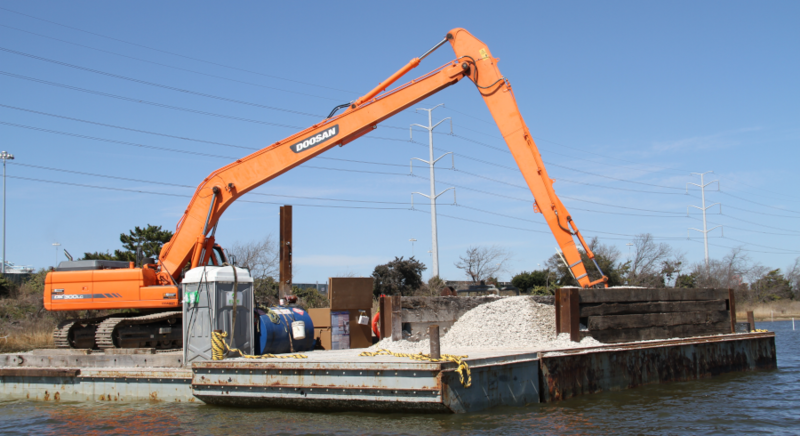 As a navigation project, Craney Island is does not accept construction and demolition debris from inland construction projects (except for road and railroad construction). Dredging sediments from shipping channels and anchorages, barging/pumping the "spoils" to Craney Island, and depositing them inside the containment dikes requires powerful machinery. Dredge spoils are pumped over the eastern dike and the heavy sand particles accumulate there. Smaller particles of clay are carried further west. The water in the pumped material finally exits the containment cell through spillboxes in the western dike. The dikes are constructed of sand, not from the clay-rich scraped up from the river channels. The Corps excavates sand that migrates into the channel, or that accumulates on the eastern side of the Craney Island containment cell, and uses it to raise the height of containment dikes. The process by which the water is supposed to be cleansed takes two miles to complete. Pumped onto the island's east side, water containing the dredged material drains slowly across the 2-mile island, which slopes gently to the west, a process estimated to take between two to four days, McGee said. As it makes its way, the bits of river bottom suspended in the water fall out: first heavier objects such as shells and coarse sand particles, and then later the microscopic clay particles. The water forms a large pool that's typically 4 to 5 feet deep on Craney Island's west side, where the remaining particles settle out. The corps siphons off the top layer of water, the cleanest, through a series of "spillways," concrete and steel structures with wooden boards that can be adjusted to the water's height. In the 1950's, the projected life of the facility was 20 years before it would be full. It was clear in the 1970's that expansion, or a new location, was necessary. By 1980, the 130 million cubic yards of fill had created a surface extending 15 feet above mean low water. 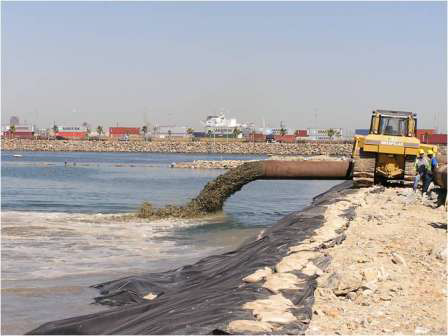 The site had received 35% more than the anticipated capacity, thanks to unpredicted settling of the marine clay due to the weight of the heavy dredge spoils. Initially, the entire 2,500-acre area within the containment dikes stayed wet as new dredge spoils were constantly added. That limited compaction. To increase ultimate capacity, internal dikes at Craney Island were constructed to create three cells in the 1980's. Sediments were pumped into each cell on a three-year cycle. The three-cell arrangement allowed sediments in each cell to dry out and compact for two years, as particles of different sizes realigned in a process described as "selfweight consolidation" and as underlying clay soils were compressed. The dikes were also raised to 30' in height to extend the disposal site's projected life. However, in 1989 the US Army Corps of Engineers predicted Craney Island would run out of space for new dredge spoils within a decade. 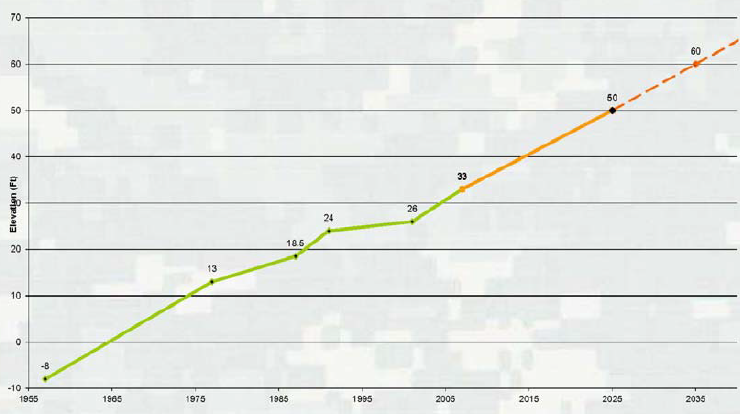 The Corps considered alternatives other than just expanding capacity at Craney Island. 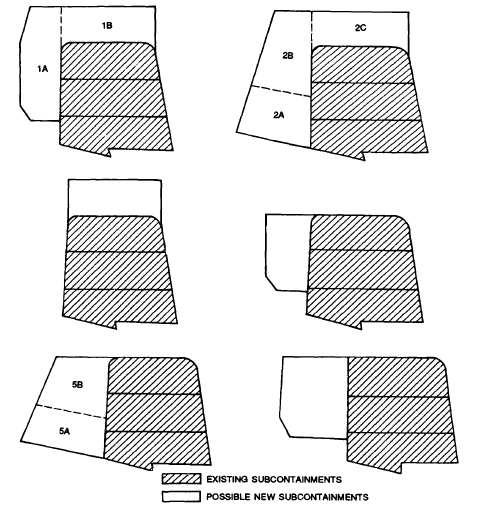 Disposal of dredged materials in the open ocean had begun in the 1950's. The Dam Neck Ocean Disposal Site was created when the Thimble Shoals Channel was deepened to 45' in the 1960's. After the Water Resources Development Act of 1986 authorized dredging a 60' Atlantic Ocean Channel and deepening the Thimble Shoals Channel, Newport News Channel, and Norfolk Harbor Channel (to Lamberts Point) to 55', the search for cost-effective dredge disposal sites expanded. The sands removed from the bottom of the Atlantic Ocean Channel and the Thimble Shoals Channel were suitable for recycling as beach replenishment material, but the muddy sediments from the Elizabeth River are not suitable for that use. 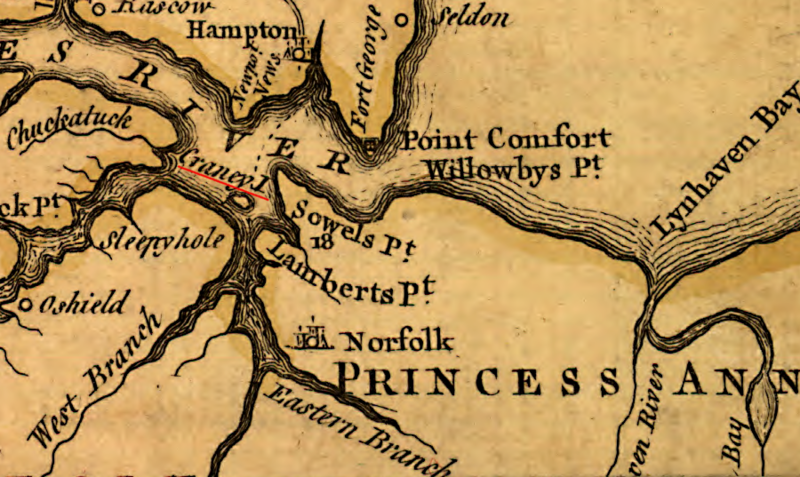 Expansion to the east was impossible because of the proximity of the Elizabeth River ship channel; to the south was located prime residential land. Thus, expansion possibilities were limited to the west and north. 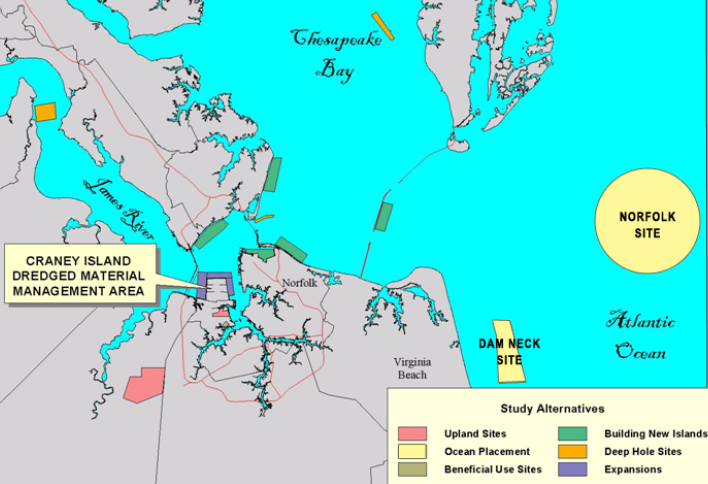 The Virginia Port Authority encouraged the Corps of Engineers to expand the Craney Island eastward, thus avoiding the conflict with Suffolk and Portsmouth landowners on the west side. 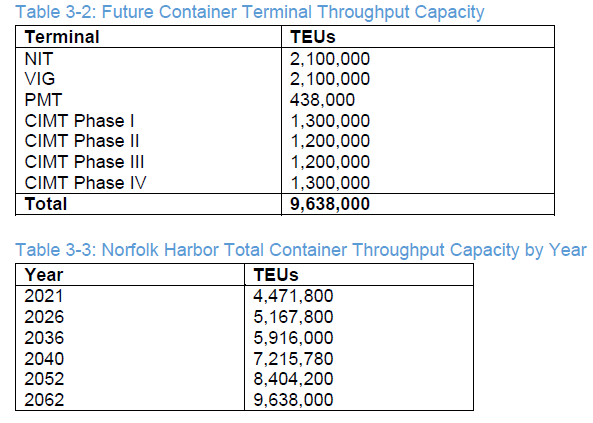 Instead of limiting navigation, an expansion into the Elizabeth River offered the unique opportunity to create a new terminal for container ships, which the state port agency had identified as a critical need by 2018. In 2003, the commander of the Corps's Norfolk District suspended its feasibility study for expanding Craney Island to the east after determining the environmental impacts would be excessive. In 2004, a new commander re-opened the study and the Environmental Impact Statement was completed in 2006. The Federal agency supported creation of a 580-acre addition on the east side, accommodating three more years of dredge spoil (later increased to nine years). 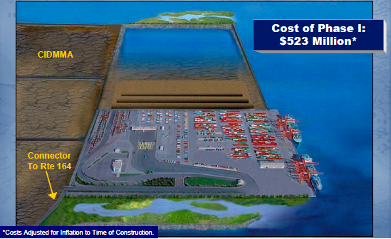 After a 220-acre expansion cell was completed, the Port of Virginia could construct the first phase of a new shipping terminal by 2017. Filling a 360-acre cell to the north would finish the extension project and allow expansion of the terminal. The Corps of Engineers preferred but did not recommend the primary alternative, which also included reinforcing the dike on the west side. Opposition by state and local officials blocked that alternative. 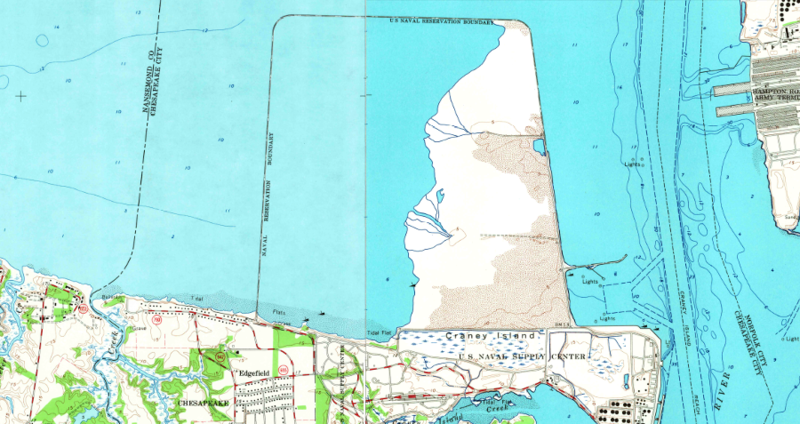 The Corps endorsed the Locally Preferred Plan with no alterations on the west side, but noted that west dike reinforcement was not needed until 2028 so that option could be reconsidered later. 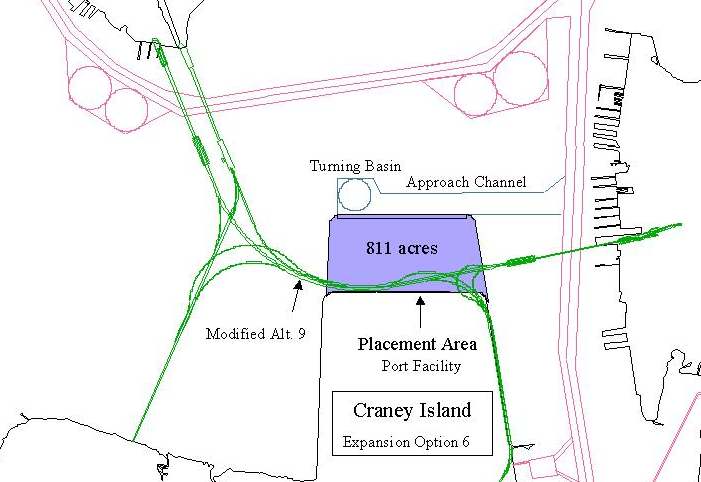 The potential impact on Virginia's economy of creating a new terminal on Craney Island was briefly a factor in the 2006 US Senate election. Incumbent Sen. George Allen, in a debate with Democratic challenger Jim Webb, asked "what's your position on the proper use of Craney Island? Webb, a former Secretary of the Navy, responded ""I'm not sure where Craney Island is. Why don't you tell me?, and Sen. Allen snapped "Craney Island's in Virginia." The average person will be like, "Can you believe it, Jim Webb didn't know about Craney Island," when the truth is they didn't know about it either." 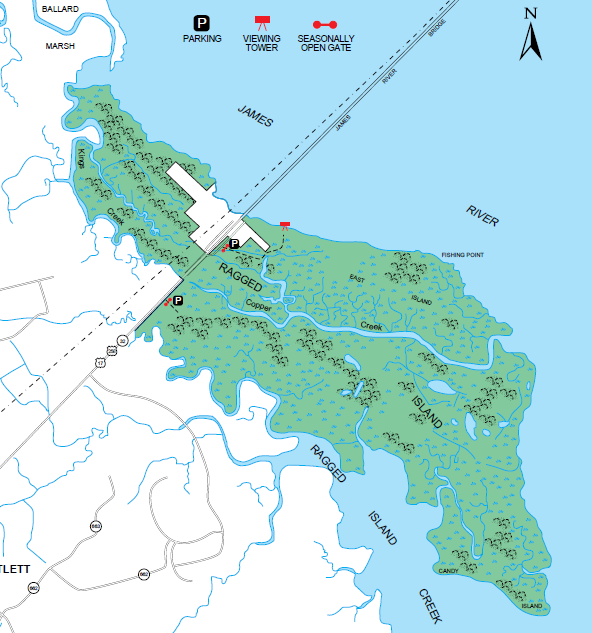 The Water Resources Development Act of 2007 formally authorized the Craney Island Eastward Expansion project. Senator Webb knew about it then, and he voted in favor. New dikes for the expansion on the east side are made of sand; building a bulkhead of steel sheet piles or concrete would have been far more expensive. 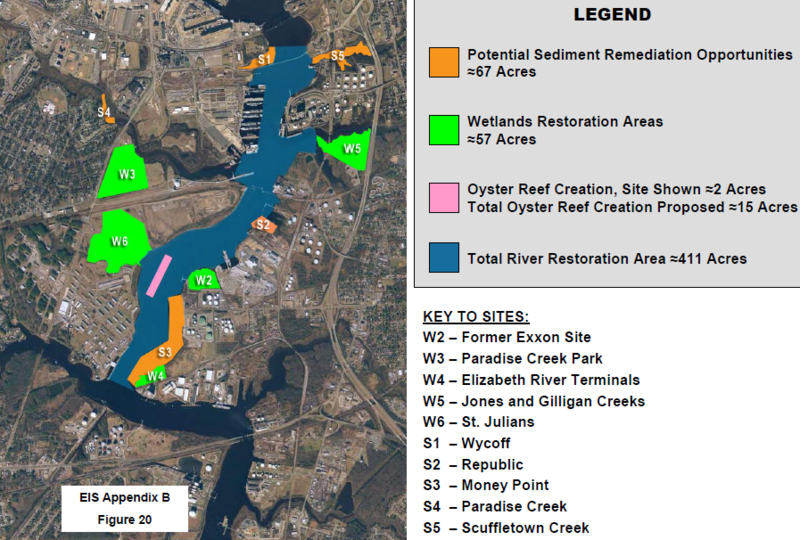 The Corps considered constructing those dikes from material dredged when creating the 50-foot deep access channel in the Elizabeth River to the new Craney Island Marine Terminal (CIMT), but those river sediments included too much clay. 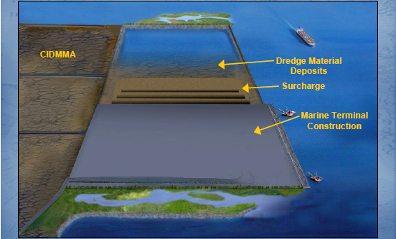 The top layer of dredged Elizabeth River sediments excavated for construction of the new channel to the proposed new terminal at Craney Island were deposited in the Craney Island Dredged Material Management Area. That top layer was presumed to be contaminated with toxic wastes from creosote plants and industrial operations upstream. 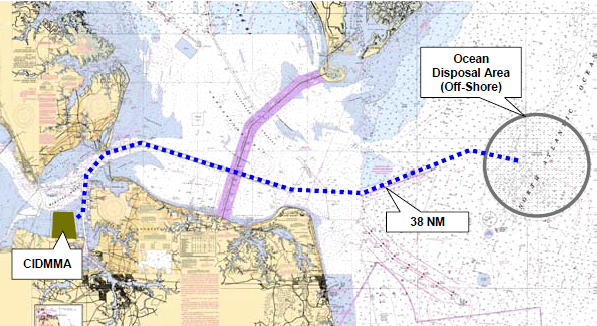 The remaining clay-rich sediments from deeper in the channel were considered to be low risk and barged to the Norfolk Ocean Disposal Site (NODS). At the site of the new dikes on the eastern side of the Craney Island Dredged Material Management Area, overlying sediments of the Norfolk Formation were excavated to reach the sandier (and more-stable) Lower Norfolk Formation and the Yorktown Formation. Dikes were then constructed from sand barged in from the Atlantic Ocean Channel and Thimble Shoal Channel, which are dredged regularly to maintain channel depths. The height of Craney Island will continue to grow as various shipping channels in the Elizabeth River and Chesapeake Bay are deepened/maintained and dredged materials are deposited behind the dikes. Further up the Chesapeake Bay, the Corps has constructed a similar facility for the Port of Baltimore at Poplar Island. Craney Island is built on soft sediments, and is sinking. The eastward extension is designed to sink 20', more than the height of a two-story building. The new cells are designed to support the 580-acre marine terminal for processing cargo containers, the Craney Island Marine Terminal (CIMT). The Port of Virginia does not want subsidence that could result in cracking pavement or tilting cranes. 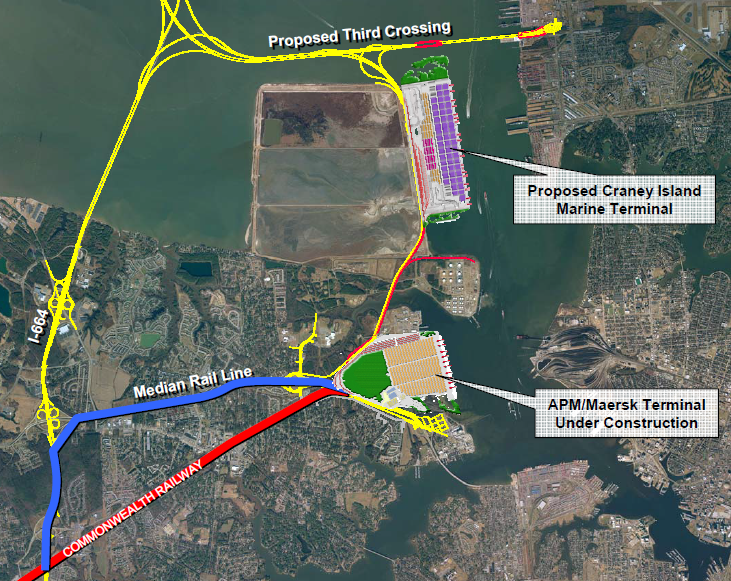 The proposed Craney Island Marine Terminal (CIMT) will include a road and rail connection to the Western Freeway (VA 164) on the south. The Commonwealth Railway will carry containers to either Norfolk Southern or CSX, both of which offer service already at the Virginia International Gateway (VIG) terminal. The Western Freeway will provide access for trucks to I-664, which will allow trucks to reach I-64 on the north (via the Monitor-Merrimac Bridge-Tunnel) or US 58/460 on the south. Norfolk Southern can utilize the Heartland Corridor to transport containers from Hampton Roads to the Midwest, via Roanoke. Traffic going north beyond Alexandria, or south through North Carolina, can use the CSX. 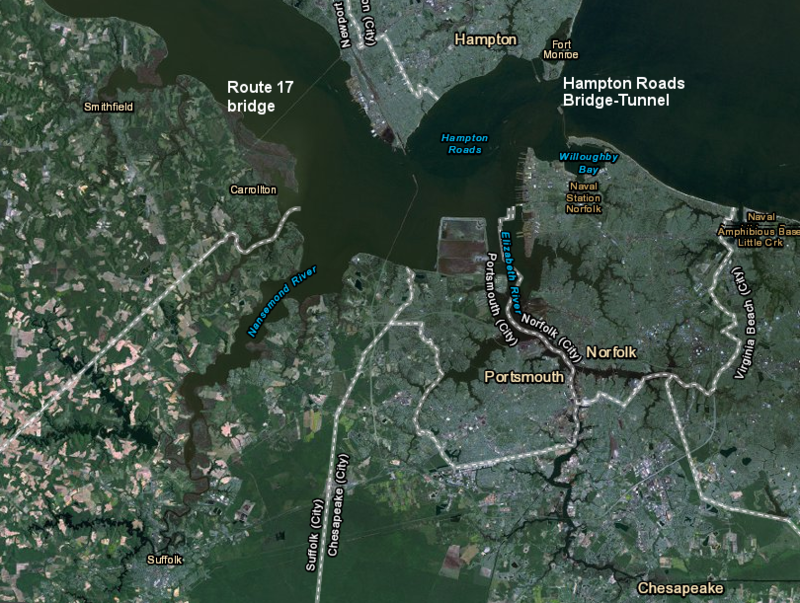 The proposed Patriots Crossing bridge-tunnel, designed to link Norfolk to the I-664 Monitor-Merrimac Bridge-Tunnel, would facilitate truck traffic. 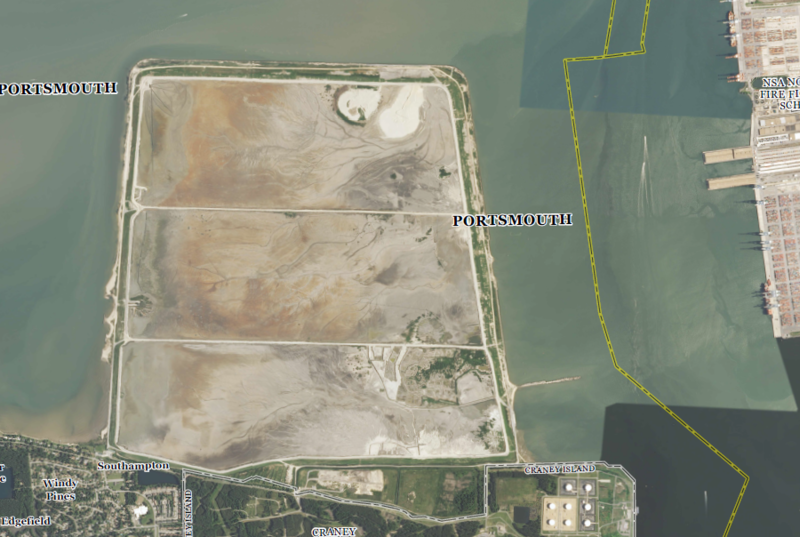 Patriots Crossing would be built north of the Craney Island Dredged Material Management Area and the new terminal. If actually completed, trucks with double-stacked containers could drive via that "third crossing" to I-664, then north to I-64 and west to the Interstate 95 corridor. 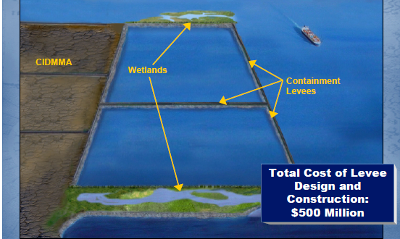 The Corps of Engineers justified expansion of the Craney Island Dredged Material Management Area in 2006 based on a need for increased cargo-handling capacity in Hampton Roads. In 2010, the Virginia Port Authority leased the APM Terminal (APM) in Portsmouth for 20 years. 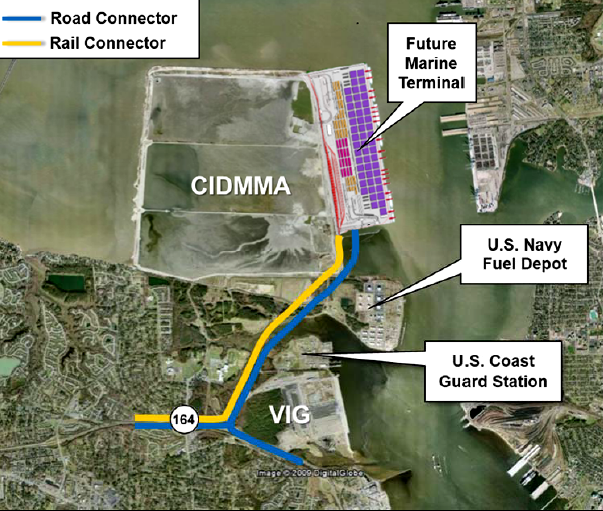 In 2012, as Virginia again considered privatizing its shipping terminals, the Corps of Engineers re-analyzed the proposed Federal investment in the Craney Island Marine Terminal (CIMT) project. Studies and plans are projections that may come true in the long run, but the Virginia Port Authority business conditions in 2012 were not optimistic. 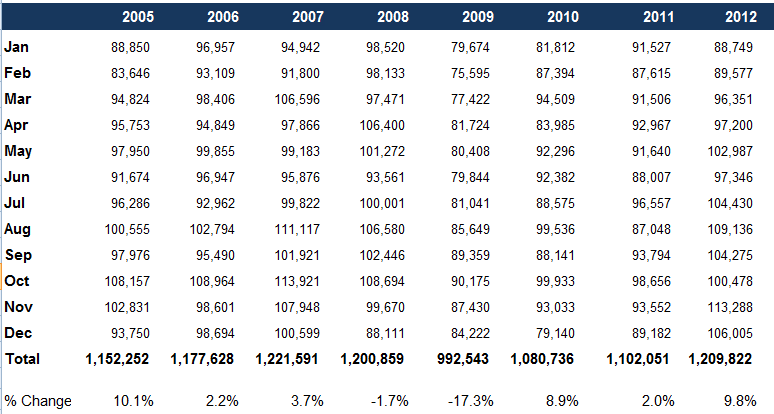 Starting with the 2008 recession, the Virginia Port Authority lost money for five years in a row. 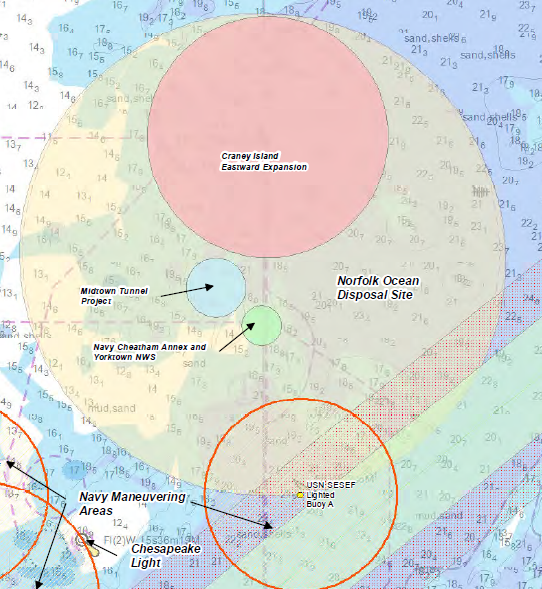 Plans to build a new terminal on Craney Island slowed down after Governor McAuliffe was elected to replace Governor McDonnell in 2013. The new governor retained key state transportation leaders, but they shifted their strategy for increasing capacity to process containers at the Virginia Port Authority terminals. 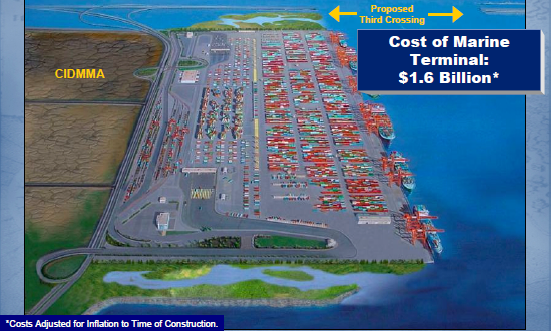 In 2014, after completing return-on-investment calculations, Virginia officials chose to expand the existing Portsmouth Marine Terminal (PMT) rather than speed up construction at the new Craney Island Marine Terminal (CIMT). Governor McAuliffe also chose to negotiate an extension of the state's 20-year lease of APM Terminal (APM), which in 2014 was renamed the Virginia International Gateway (VIG) after the A. P. Moller�Maersk Group sold its ownership to a British pension fund. 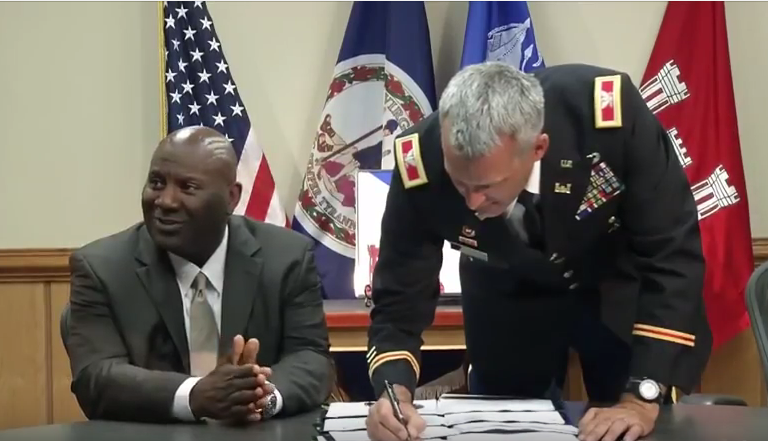 The governor signed an extension of the Virginia International Gateway (VIG) lease to the year 2065. The extra time justified the state spending $300 million for new equipment at that terminal. The General Assembly also approved $350 million to increase the capacity to process containers at Norfolk International Terminal (NIT). Who Owns Submerged Lands After They Emerge Through Accretion and Landfilling?